Ambarella, with Latin name Spondias dulcis and commonly known as kedondong is a tropical tree actually an equatorial or tropical tree, with edible fruit containing a fibrous pit. 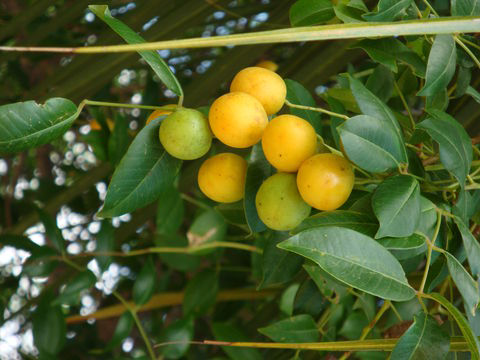 It is known by many other names in various regions, including kedondong in Indonesia, buah long long among the Chinese population in Singapore, pomme cythere in Trinidad and Tobago, Dominica, Guadeloupe, and Martinique, June plum in Bermuda and Jamaica. The plant is native to South and Southeast Asia. It is widely cultivated in Malaysia, India, Sri Lanka, and some parts of Africa. Some of the popular common names of the plant are Dwarf ambarella, Golden apple, Great hog plum, Hog plum, Jew plum, Otaheite apple, Polynesian plum, Tahitian quince, Yellow plum, ambarella, Jewish plum, Oatahette Apple, wi-tree and Wi-Apple. 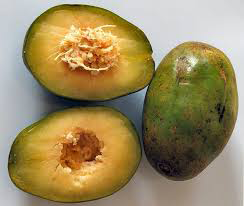 It belongs to the Anacardiaceae family which also includes several important tropical fruit trees such as mango and cashew. Ambarella is a vigorous deciduous tree that grows about 10–25 m high or may grow to 45 m. The plant flourishes in humid and wet tropical areas. It is rather common in lowland primary forests, sometimes in secondary forests. The plant grows on all types of soil, including acidic soils and oolitic limestone in Florida, as long as they are well drained. The plant has straight trunk usually 45 cm in diameter. Barks are greyish to light brown. Branchlets are thick, grey with fallen leaf scars. 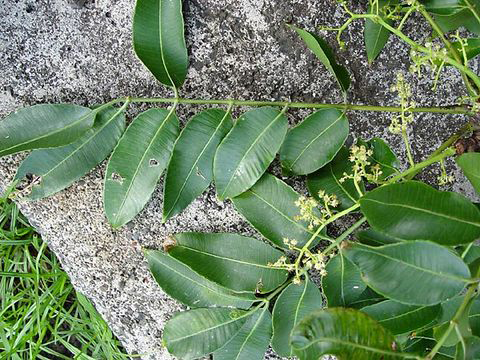 The plant has deciduous, pinnate leaves, 8 to 24 in (20–60 cm) in length, composed of 9 to 25 glossy, elliptic or obovate-oblong leaflets 3.5 to 4.0 in (6.25–10 cm) long, which are finely toothed toward the apex. Leaflets are opposite to sub-opposite, sub coriaceous petiolulate (7.5 mm) ovate–oblong to lanceolate, 5–20 cm long by 1.5–8 cm wide, dark green, glossy above paler green beneath, base acute, oblique, apex shortly acuminate to acuminate margin serrate or crenulated with 14–24 pairs of nerves. 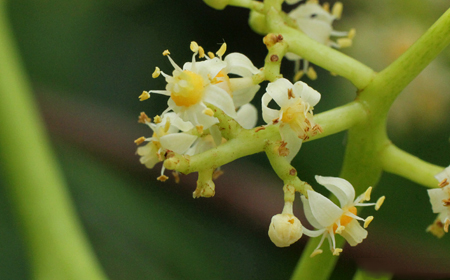 Flowers are white or creamy-white, calyx glabrous, 5-partite, segments deltoid, petals 5–6, reflexed, glabrous, ovate-oblong with 3 longitudinal nerves, stamens 10 longer than petals, glabrous with oblong anthers. Style 5 free, ovary is sub globose and 4–5 loculed. Fruit is indehiscent drupe, ellipsoid or oblong, glabrous, 2.5 to 3.5 in (6.25–9 cm) long, are borne in bunches of 12 or more on a long stalk. The fruit is green and hard when young turning greenish-yellow, yellow or golden yellow when ripe with thick, yellow, sub acid to acid, juicy pulp enclosing a woody, fibrous endocarp with 5 flanges, the flanges often indirectly connected with a peripheral layers of meshes formed by numerous spinose and fibrous processes. 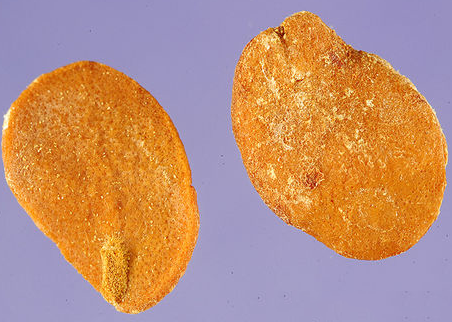 The endocarp contains several flat seeds. According to Morton, some fruits in the South Sea Islands weigh over 1 lb. (0.45 kg) each. The skin of fruit is quite tough and consists of golden colored flesh. The plant is indigenous to south and Southeast Asia. The species is extensively distributed throughout Indo-Malesia and from Melanesia to Polynesia and is widely cultivated in these areas, making it impossible to differentiate between indigenous and naturalized occurrences. It is now cultivated pan tropically in South America, Central America, the Caribbean, Florida, Africa and Australia. Leaves extract are quite beneficial for treating cough. 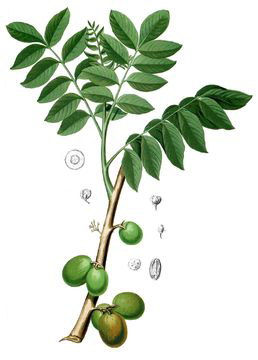 About 3 or 4 fresh leaves of ambarella tree is boiled in two cups of water and allowed to stand for few minutes. The concoction is strained and usually taken with honey. Fruit can also be used to treat cough. Two or three pieces of the ambarella fruit are shredded and the water is squeezed. A pinch of salt can be added to the extract and consumed thrice a day to relieve cough. The fruit consists of good amount of vitamin C which helps to metabolize cholesterol into bile acids, which may have implications for blood cholesterol levels and the incidence of gallstones. So this kedondong fruit useful to control your cholesterol levels. 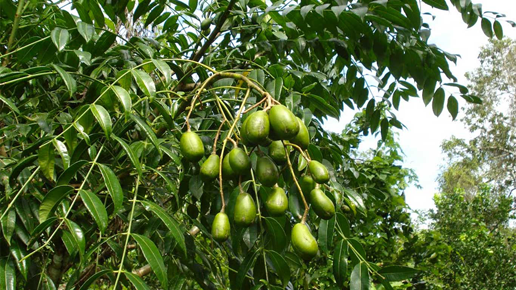 Ambarella fruit is considered a wonderful source of vitamin A. It plays an important role in the visual perception. Compound of vitamin A known as retinol helps distribute images that are received by the retina of the eye. Decoction of the ambarella leaves is used as a wash for sore eyes. With the content of the nutrients contained in fruit sugar kedondong the form element in the form of sucrose is surely very important as the vitality and endurance. 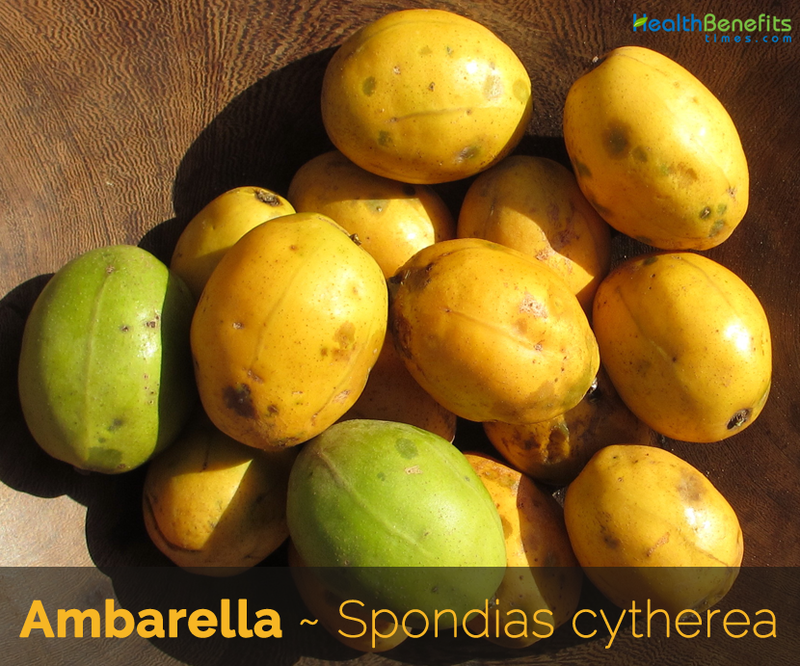 As we have discussed below Ambarella fruit is rich in vitamin C. It improves the function of the immune system. It also improves the formation of collagen and quickens the wound healing process. The fruit also consists of antioxidants and helps prevent free radical damage. Apart from that, vitamin C present in Ambarella can protect important molecules, such as proteins, lipids (fats), carbohydrates, and nucleic acids (DNA and RNA) from damage caused by free radicals, toxins, or pollutants. Free radicals are one of the causes of premature aging. Ambarella consists of good amount of dietary fiber, which facilitates digestion and helps clear the bowel. Pulp of the fruit is recommended for those who suffer from constipation and dyspepsia (indigestion). High water content of the fruit prevents dehydration. 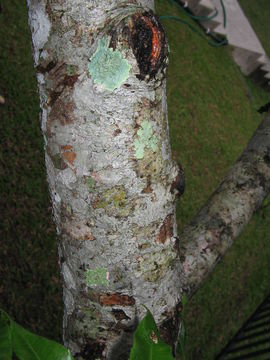 Bark of the ambarella tree is used as a remedy to cure dysentery. People suffering from diarrhea, dysentery, can take an herbal concoction of the ambarella bark to ease discomfort. The herbal concoction is prepared using 5 grams of the bark. The clean bark is boiled in two cups of water until the water is reduced to half. The strained concoction can be consumed to provide instant relief for dysentery. 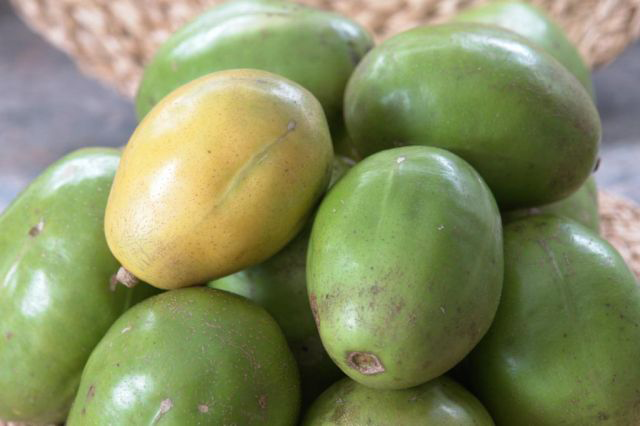 Ambarella fruit is low in fat, carbohydrate and high in dietary fiber. Though the fruit is low in calories, it provides the required nutrients to the body. Thus, it is an ideal fruit for weight loss. Water content of the fruit provides a feeling of fullness and also prevents overeating. Iron content in 100 grams of Ambarella can assist in the formation of red blood cells. In addition to iron, apparently Ambarella fruit also consists of vitamin B1 that helps in production of red blood cells and increases the flow of oxygen throughout the body and prevent anemia. The fruit consist of good amount of vitamin C that helps in tissue repair and nourishes the skin. It increases the production of collagen and improves the beauty of the skin. Ambarella is also used to treat skin diseases. Leaves of ambarella are boiled and the extract is used as a substitute for body lotion and moisturizers. Traditionally, the root of the tree is used to treat itchy skin. Antioxidants present in the fruit fight against cancer. 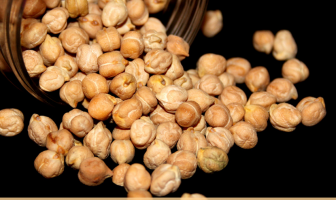 It helps in the renewal of tissues and protects against cardiovascular diseases. In some places, the ambarella fruit is used to treat injuries from burns. Scientific research has also proven that the fruit can lower high blood pressure. Seeds of the fruit are used to treat respiratory disease owing to its antibiotic content. 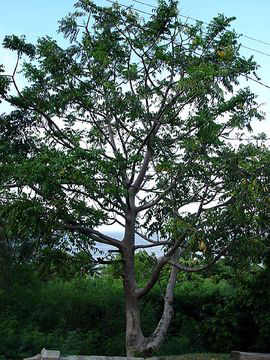 Leaves of the ambarella tree are dried and ground until powdery and used to treat mouth sores. Roots are used as a contraceptive agent. Fruit is recommended for diabetics to regulate blood sugar levels. Phosphorus and calcium content of ambarella is beneficial for maintaining healthy bones and teeth. Fruit is beneficial for women as its iron content regulates the formation of red blood cells and helps prevent anemia. Ambarella has also been used to treat urinary tract infections and hemorrhoids. Bark and leaves are also used to treat oral thrush due to its antifungal properties. Concentrated juice from the outer part of the fruit is reputedly used as a hypotensive in French Guiana. Plant is used in the treatment of wounds, sore, burns, diarrhea, eye inflammations, hemorrhage, sore throats, mouth infection, cataracts, dysentery, coughs, fever, and stomach pain among others. Parts of the plant are made into a fermented drink which is used as a remedy for diarrhea. Juice of the plant is used as eye drops to reduce eye inflammations. Shoots of the plant are used to treat hemorrhaging after childbirth. Pressed liquid obtained from the stem is given after a false pregnancy, and for weakness following childbirth. An infusion of the leaves is used to treat sore throats and mouth infections. Pressed liquid obtained from the bark is taken to cleanse the bowels. Bark filtrate is also used as an abortifacient, to promote sterility and to treat fish poisoning. Few drops of the pressed bark fluid are applied to the eyes as a remedy for cataracts. Fluid pressed from the bark is used in treating diarrhea, whilst the bark is also used to treat dysentery. Inner bark is used to treat coughs, fever and stomach aches. It is also used to treat mouth and body sores. Grated fruit, mixed with water, is used to treat high blood pressure. Young fruit is used to treat stomach trouble and to aid a woman in labor. Treatment of wounds, sores and burns is reported from several countries. Astringent bark is used with various species of Terminalia as a remedy for diarrhea in Cambodia. 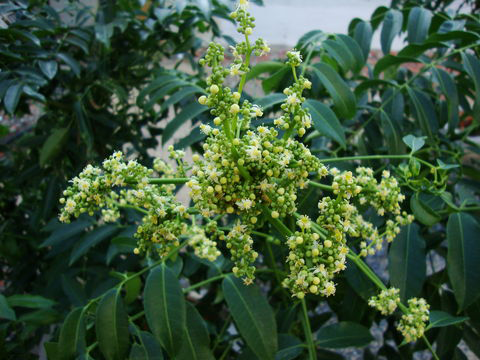 Leaves have been used for nasopharyngeal affections. Fever: Prepare a juice of Ambarella fruit. Drink it twice a day to get relief from the fever. Gonorrhea: Prepare a decoction of Ambarella leaves. Take it thrice a day. Diarrhea: Make an infusion of the leaves of Ambarella. Keep it for 5 minutes. Take it twice a day. Aphthous Ulcers: Take fresh leaves of Ambarella. Ground them with sugar. Rub the paste to mouth and gums. Fruit, young leaves and tender inflorescence are edible. Fully ripe fruit are best eaten raw and fresh. Its young leaves are used as seasoning for pepes in West Java. More mature leaves are eaten as a salad green though they are tart in Costa Rica. Fruit is best when fully colored, but still slightly crunchy. Ripe fruits are relish in fresh juice drinks, cordials and made into nectar which can be used for yogurt. Fruit is juiced, and goes under the popular name umbra juice in Malaysia. In Indonesia and Malaysia, it is eaten with shrimp paste, a thick, black, salty-sweet sauce called hayko in the Southern Min dialect of Chinese. It is an ingredient in rujak in Indonesia and rojak in Malaysia. Fruit is made into preserves and flavorings for sauces, soups, and stews. It is made into jam in Fiji. It is used to make otai in Samoa and Tonga. Fruit is soaked in vinegar with chili and other spices to make the snack food acharu in Sri lanka. 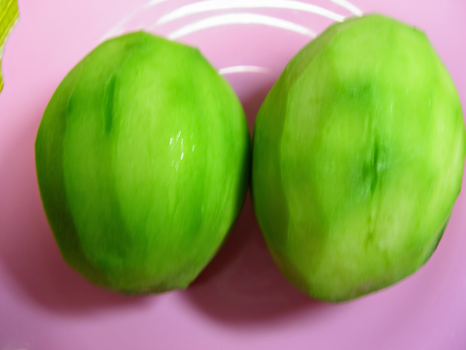 Unripe fruit is eaten with salt, sugar, and chili, or with shrimp paste in Vietnam. Children eat the fruit macerated in artificially sweetened licorice. It is mostly considered a novelty, especially by children in Jamaica. It can be eaten with salt or made into a drink sweetened with sugar and spiced with ginger. 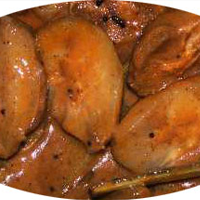 It is curried, sweetened, salted, or flavored with pepper sauce and spices in Trinidad and Tobago. It is made into a salad called nhoum mkak in Cambodia. 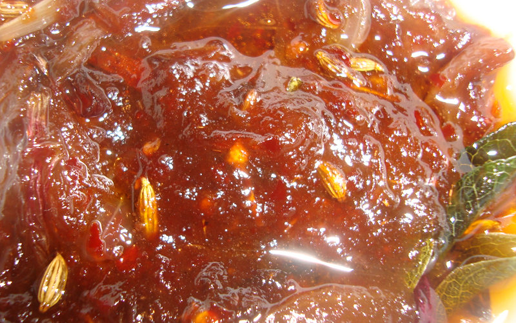 Fruit is dried and made into spicy chutney, mixed with garlic and peppers in Suriname. Fruits may be eaten raw, or made into juice, preserves, jams or flavorings. Young leaves are used as seasoning or cooked as a vegetable while mature leaves are used in salads. Unripe fruits are often used as a sour flavoring in sauces, soups etc. 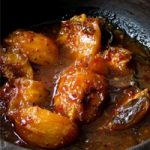 Ripe fruit are also eaten in stews and prepared as jams and sauces. Unripe fruit is excellent for making chutney or preserved as pickles in vinegar and sugar and made into manisan. Ambarella are occasionally simmered in curries, but are more commonly cooked with sugar and a stick of cinnamon. Fruit is eaten as compote or in Indonesia the unripe fruit is often mixed with other fruits in rujak, and eaten in sambal goring as the unripe fruit is excellent as a substitute for tamarind asam. 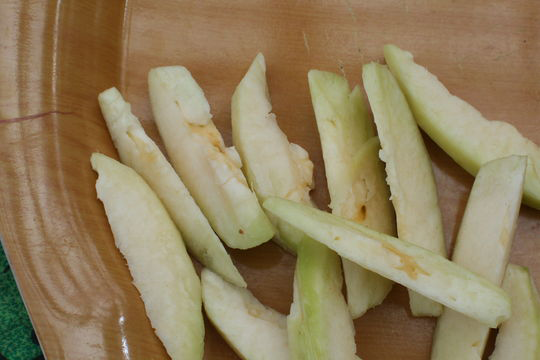 Unripe fruit is peeled and sliced and eaten with a thick black salty-sweet, fermented shrimp paste called hayko or dipped in chilli powder and salt and eaten in Indonesia and Malaysia. 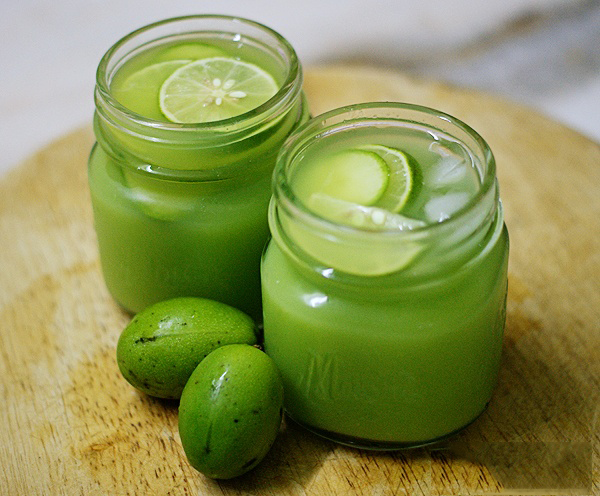 Unripe, mature, green fruit is used to make a refreshing drink that is much appreciated by the consumers of these regions in French West Indies and Grenada. Young leaves are added to salted fish and eaten as side dish with rice. Young leaves are often used as a substitute for asam or lemon to impart the sour, savory flavor to dishes. Young leaves are also cooked with tough meat to tenderize them. Young, tender panicles can be eaten steamed or dressed as salad. If you have bought ambarella that needs further ripening you can have them stored at room temperature. In a week’s time it will be ripen. When kept in the refrigerator, it will come for weeks. Plant is said to be grown as a living fence. Heartwood is light brown; the sapwood whitish to light yellow. Wood is light in weight; moderately soft; not durable. Wood is light-brown and buoyant and in the Society Islands has been used for canoes. Bar yields a resinous gum. Fruit is fed to the pigs and the leaves given to cattle. Over medium heat add oil to a pan, once the oil heats; add the Curry leaves, Cardamom Pods and Cinnamon Stick, gently cook to draw out the flavor. 3-5 minutes. While the liquid simmers, add chilli flecks and green chilies, continue cooking over medium heat. Cut ambarella into small pieces. Add garlic, green chilies, onion, curry leaves, rampa, turmeric powder, chilli powder, curry powder and sugar. Then add coconut milk (second extract). Cook for about 10 minutes and add coconut milk (first extract). Cover with the lid and cook for another 15 minutes on very low heat. Finally add roasted mustard seeds. Previous ArticleWhat is Fruit Leather? Soil Grows on all types of soil, including acidic soils and oolitic limestone in Florida, as long as they are well drained. Care should be taken when eating the fruit since the seeds have very sharp spines.